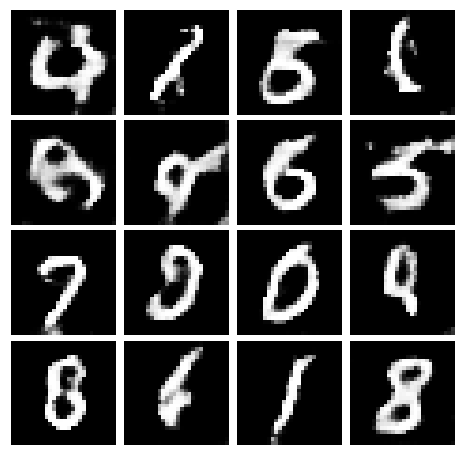 WARNING:tensorflow:From <ipython-input-2-d681c923e097>:2: read_data_sets (from tensorflow.contrib.learn.python.learn.datasets.mnist) is deprecated and will be removed in a future version. 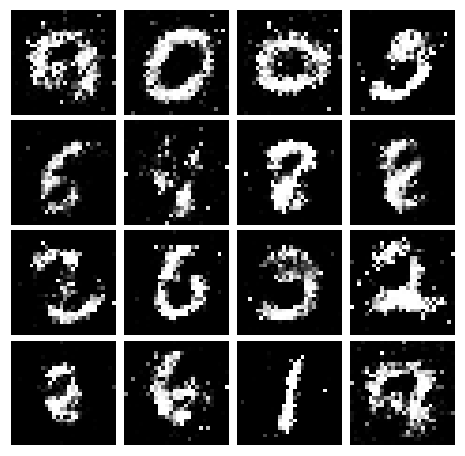 WARNING:tensorflow:From /root/.pyenv/versions/miniconda3-4.3.30/envs/caffe2/lib/python3.6/site-packages/tensorflow/contrib/learn/python/learn/datasets/mnist.py:260: maybe_download (from tensorflow.contrib.learn.python.learn.datasets.base) is deprecated and will be removed in a future version. 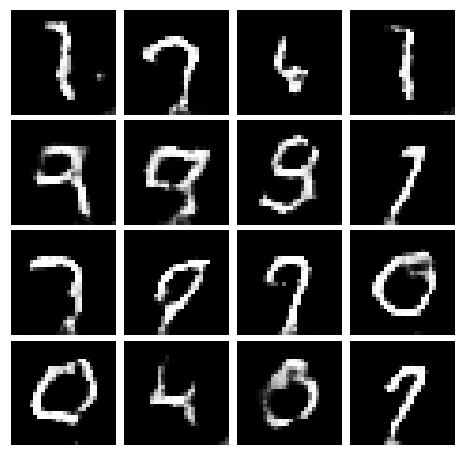 WARNING:tensorflow:From /root/.pyenv/versions/miniconda3-4.3.30/envs/caffe2/lib/python3.6/site-packages/tensorflow/contrib/learn/python/learn/datasets/base.py:252: _internal_retry.<locals>.wrap.<locals>.wrapped_fn (from tensorflow.contrib.learn.python.learn.datasets.base) is deprecated and will be removed in a future version.  Please use urllib or similar directly. 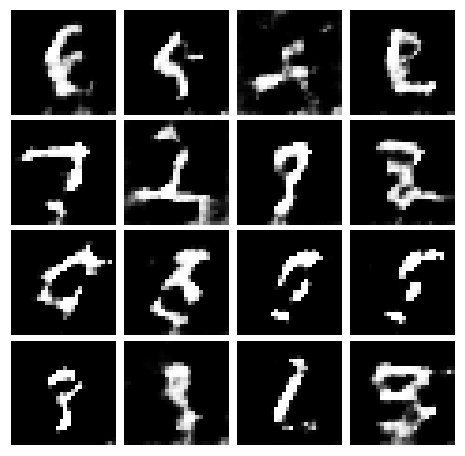 WARNING:tensorflow:From /root/.pyenv/versions/miniconda3-4.3.30/envs/caffe2/lib/python3.6/site-packages/tensorflow/contrib/learn/python/learn/datasets/mnist.py:262: extract_images (from tensorflow.contrib.learn.python.learn.datasets.mnist) is deprecated and will be removed in a future version. 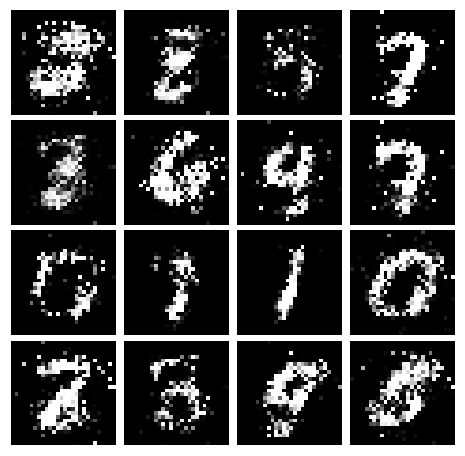 WARNING:tensorflow:From /root/.pyenv/versions/miniconda3-4.3.30/envs/caffe2/lib/python3.6/site-packages/tensorflow/contrib/learn/python/learn/datasets/mnist.py:267: extract_labels (from tensorflow.contrib.learn.python.learn.datasets.mnist) is deprecated and will be removed in a future version. 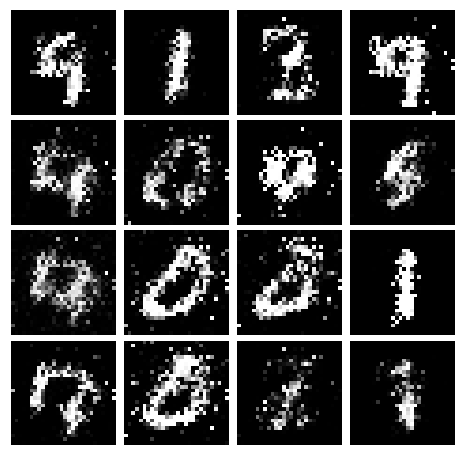 WARNING:tensorflow:From /root/.pyenv/versions/miniconda3-4.3.30/envs/caffe2/lib/python3.6/site-packages/tensorflow/contrib/learn/python/learn/datasets/mnist.py:290: DataSet.__init__ (from tensorflow.contrib.learn.python.learn.datasets.mnist) is deprecated and will be removed in a future version. 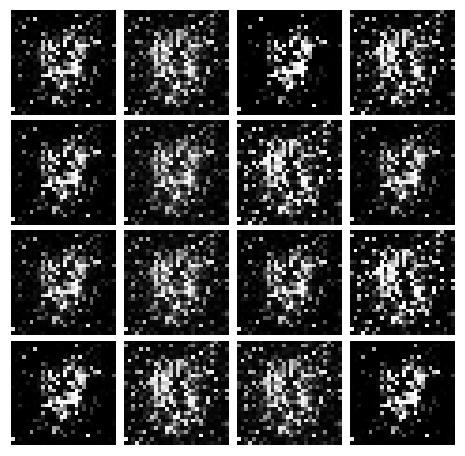 """Compute the leaky ReLU activation function. 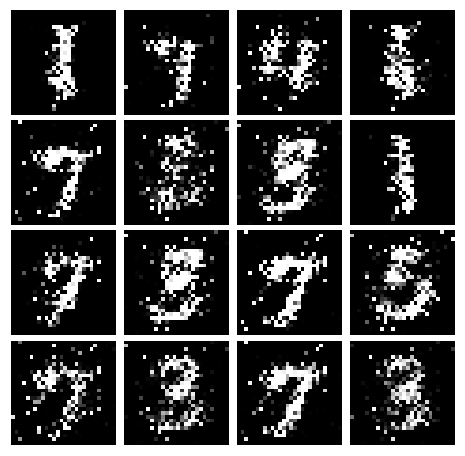 """Generate random uniform noise from -1 to 1. 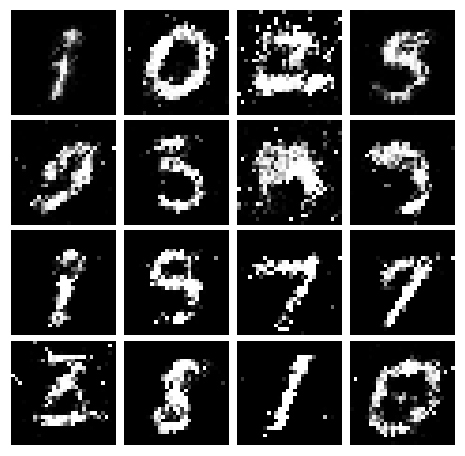 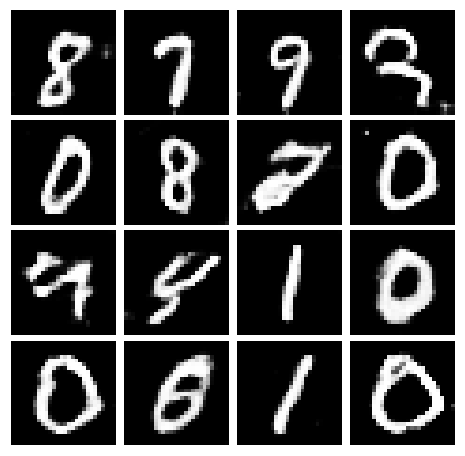 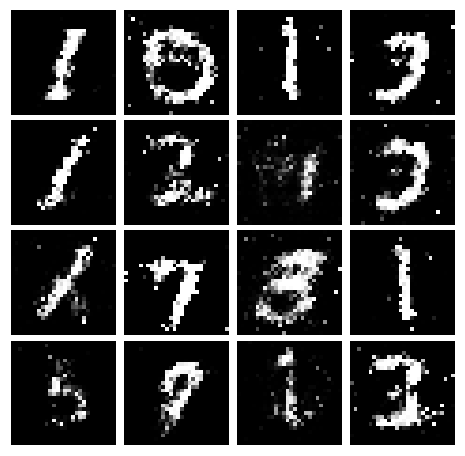 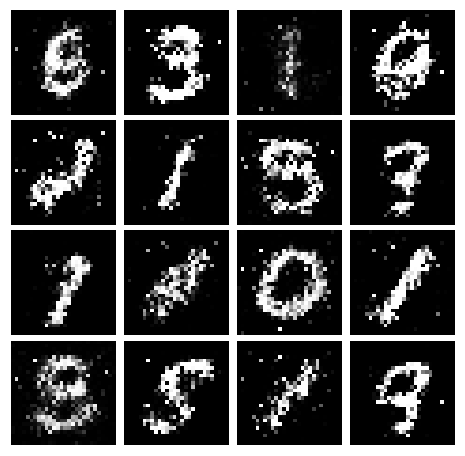 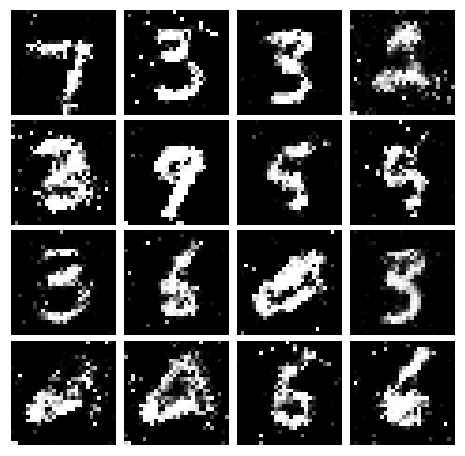 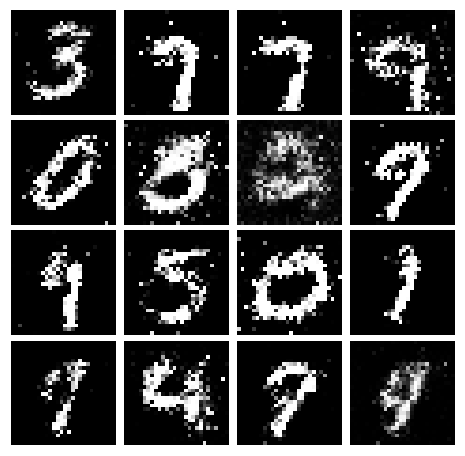 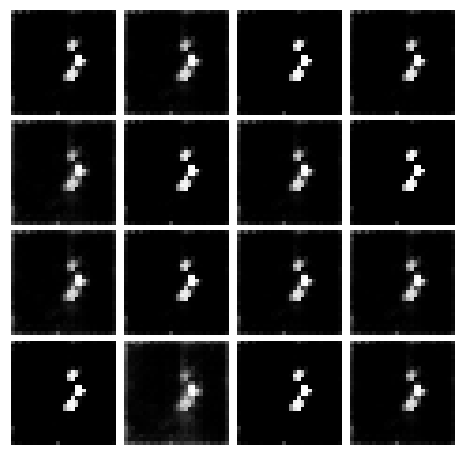 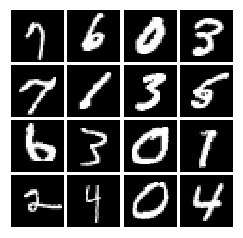 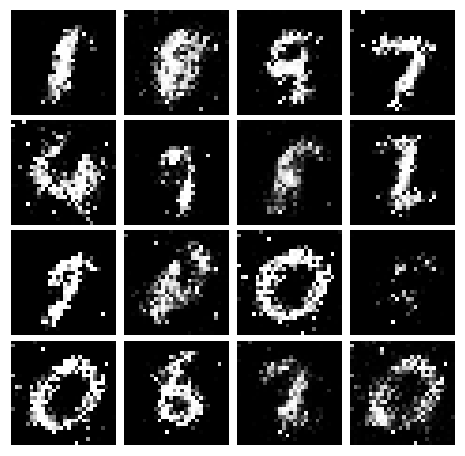 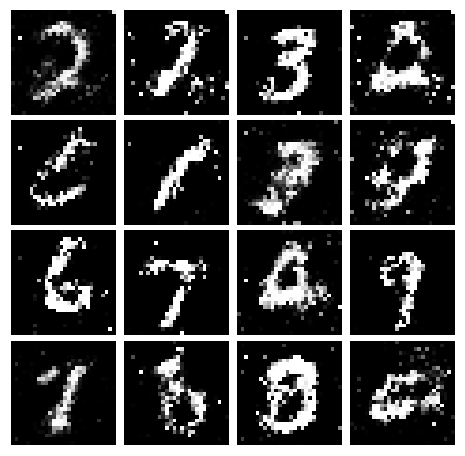 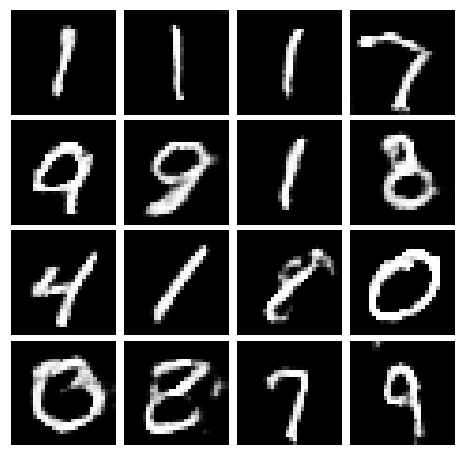 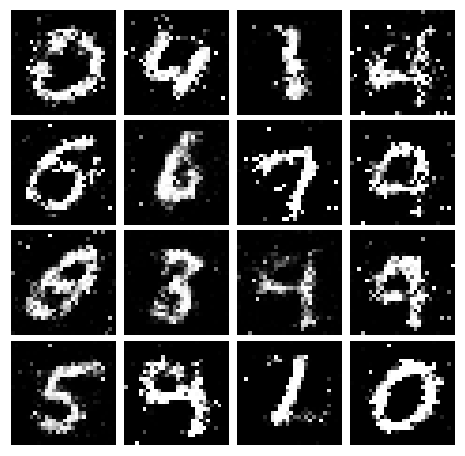 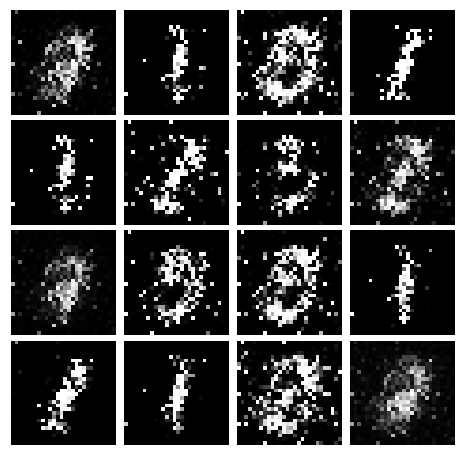 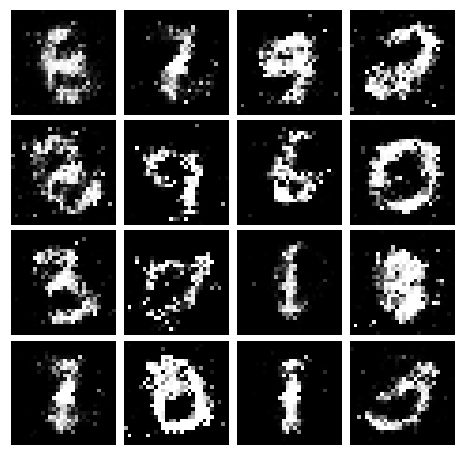 """Compute discriminator score for a batch of input images. 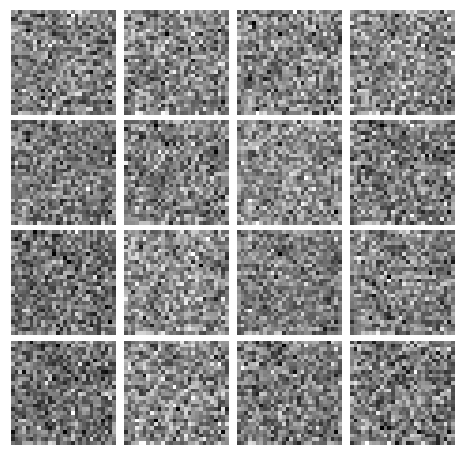 for an image being real for each input image. 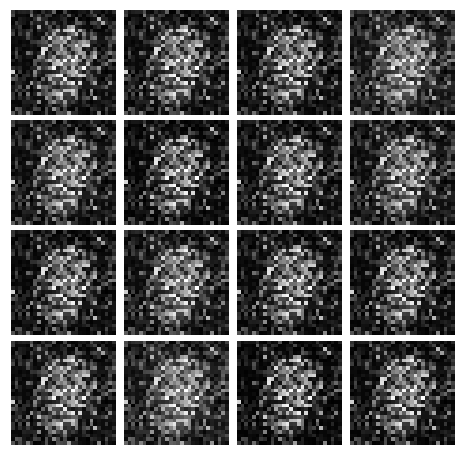 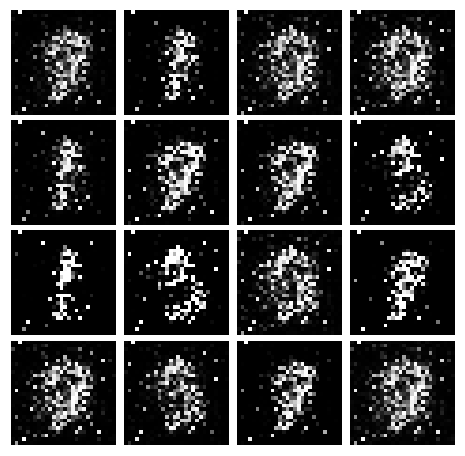 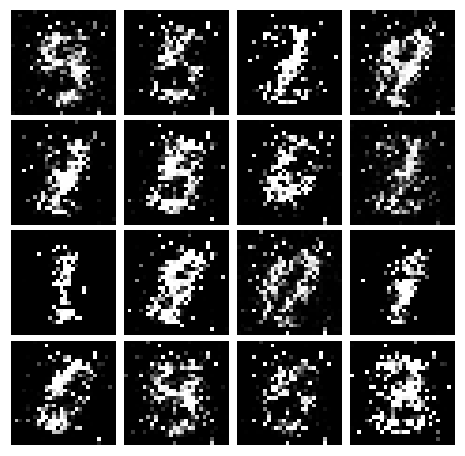 """Generate images from a random noise vector. 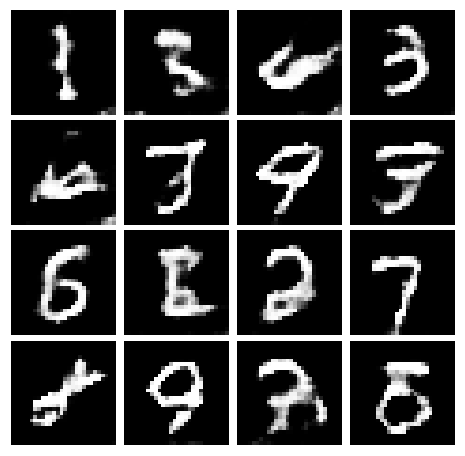 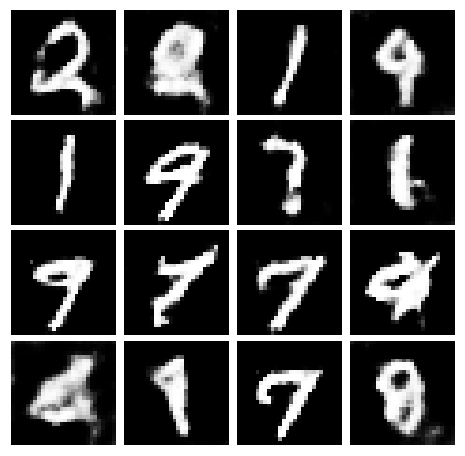 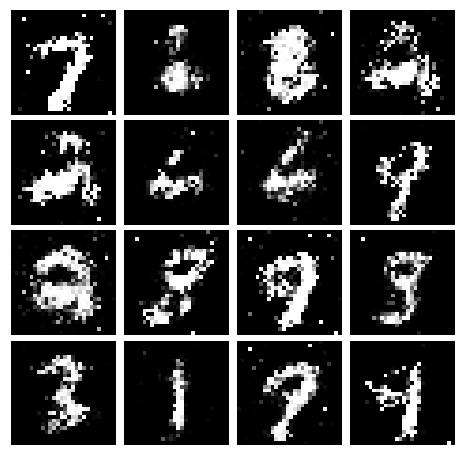 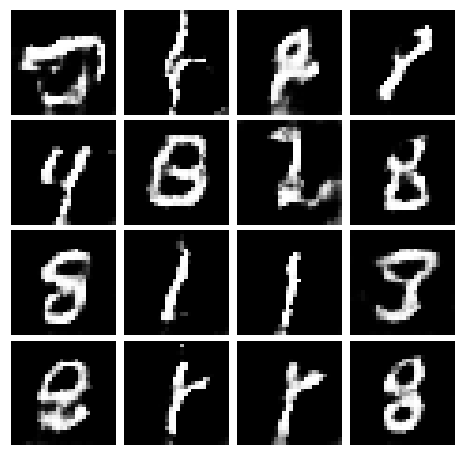 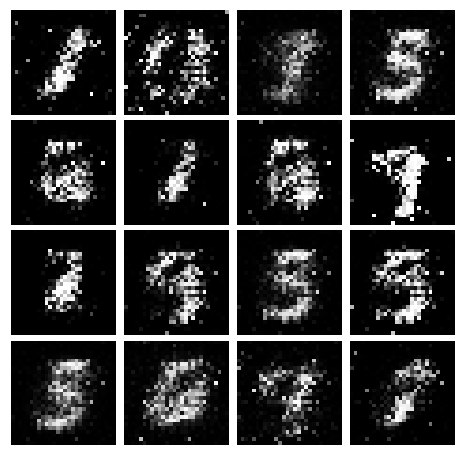 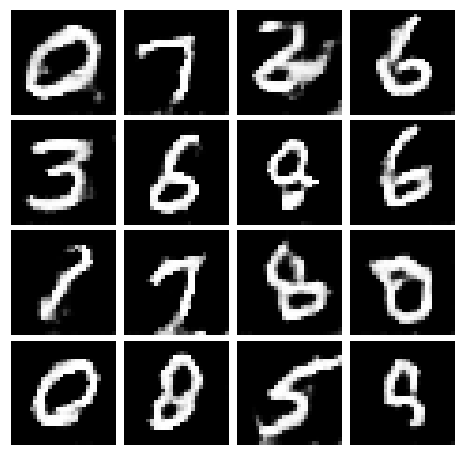 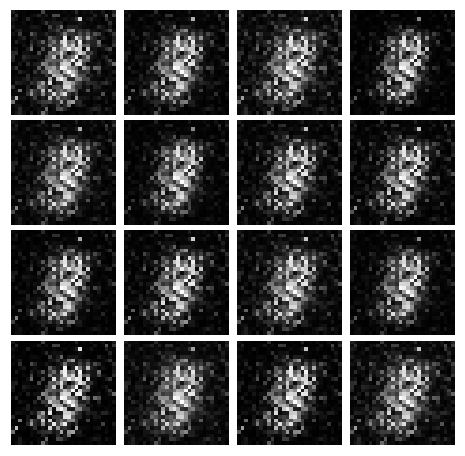 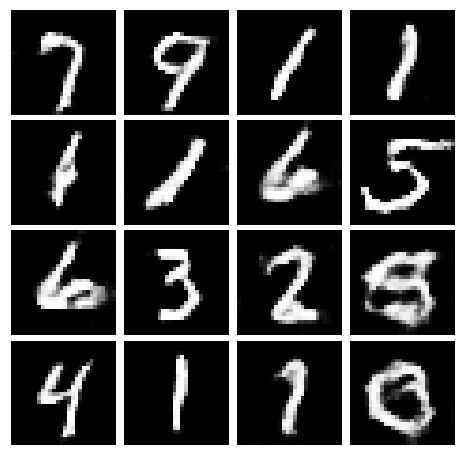 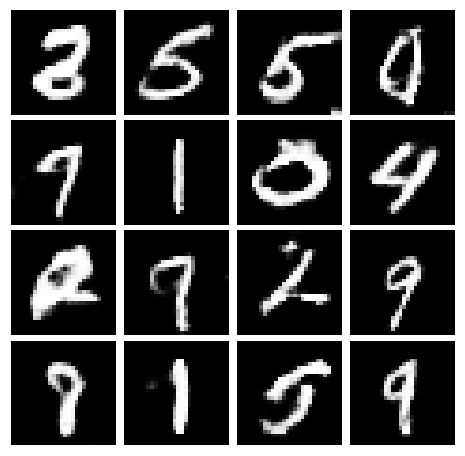 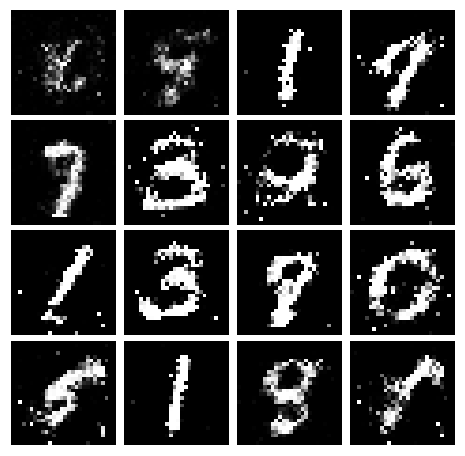 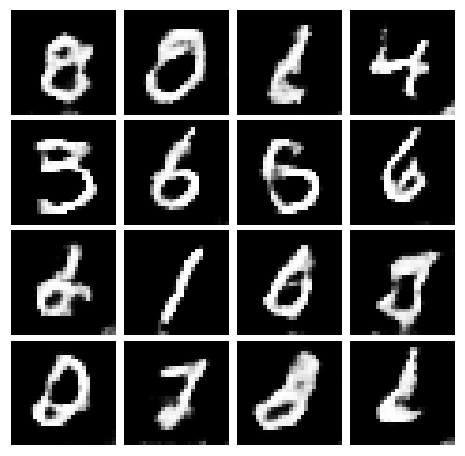 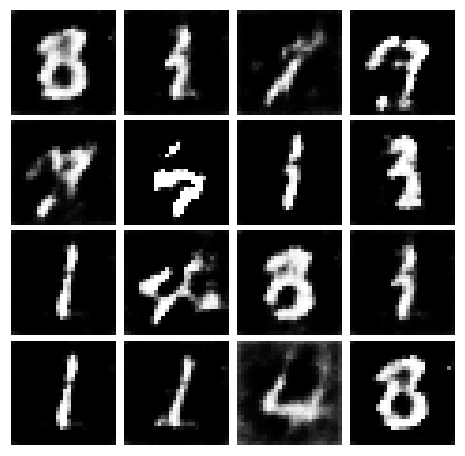 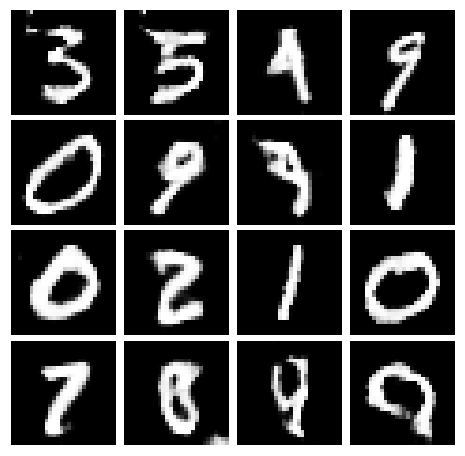 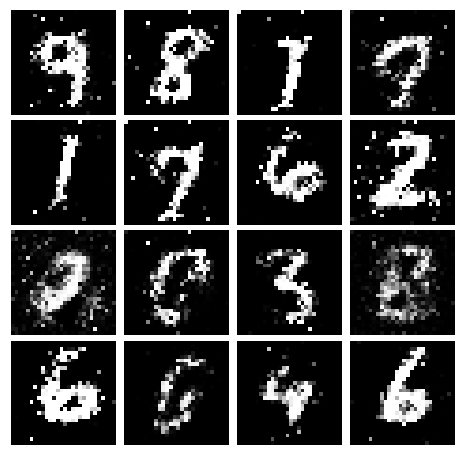 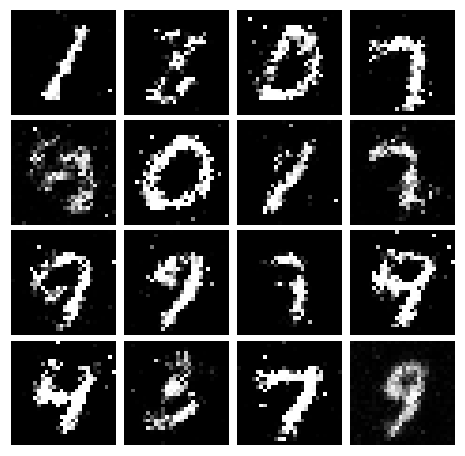 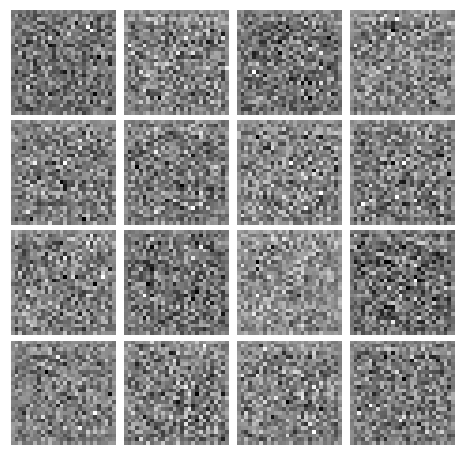 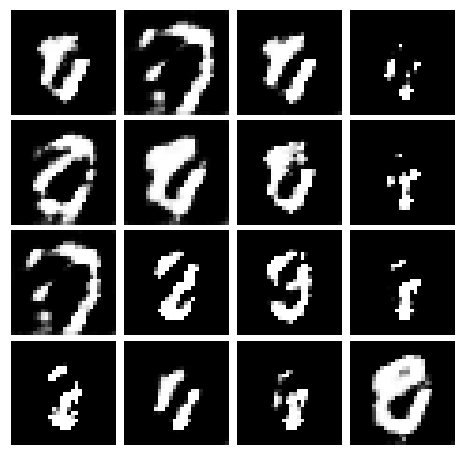 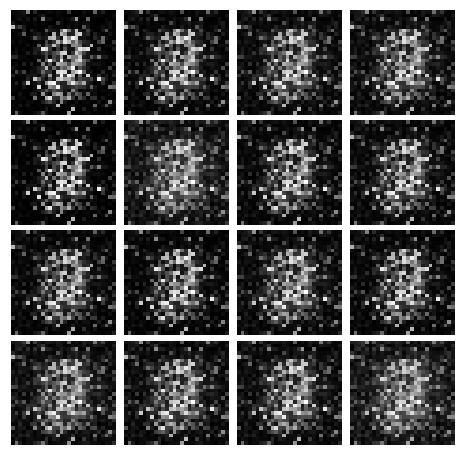 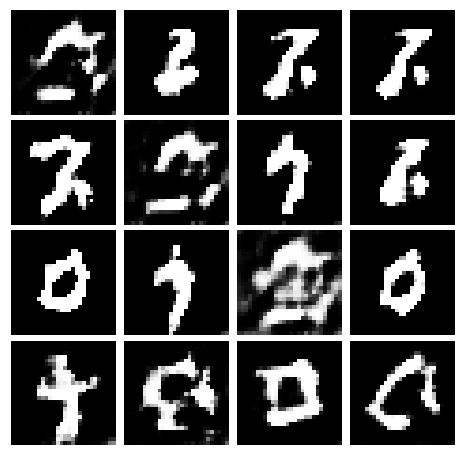 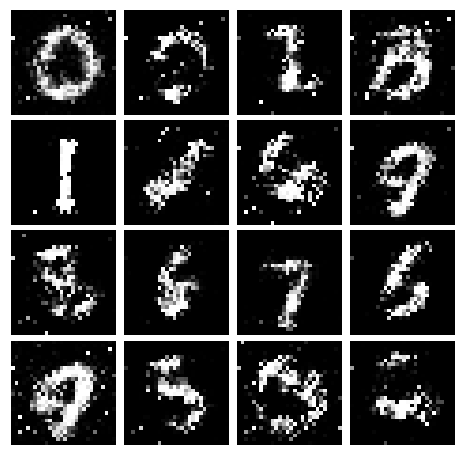 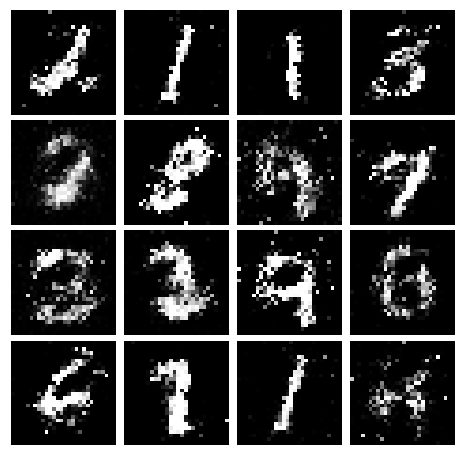 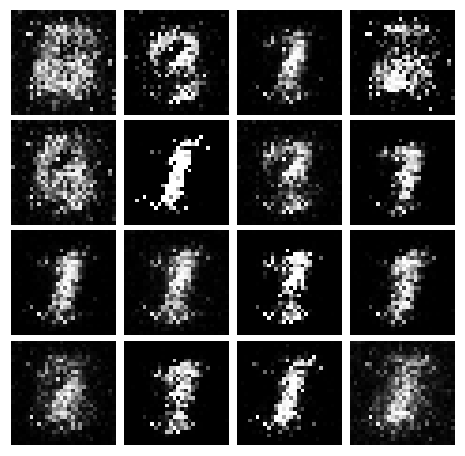 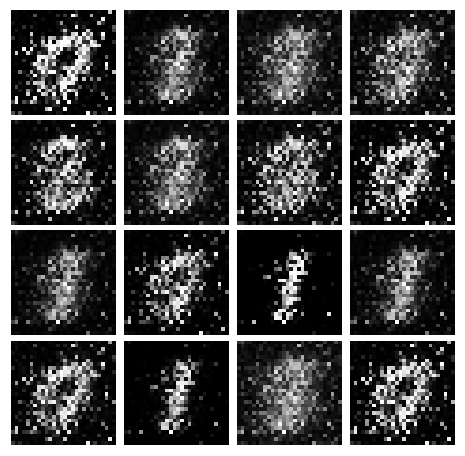 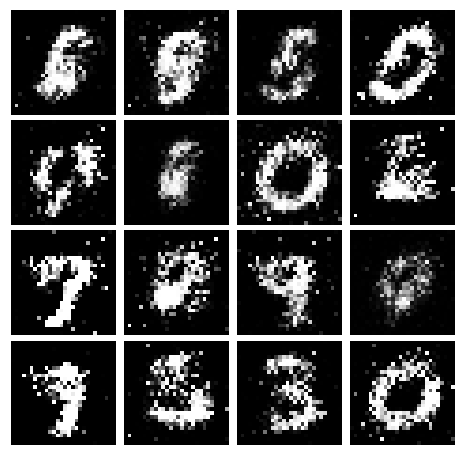 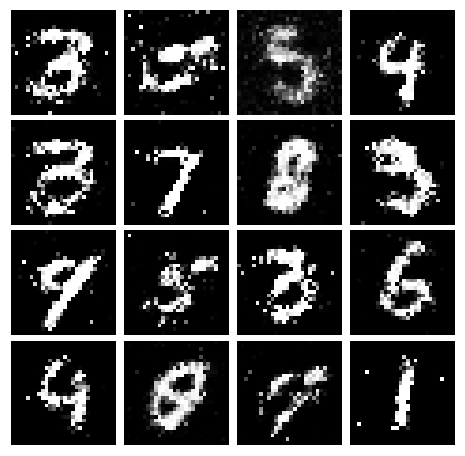 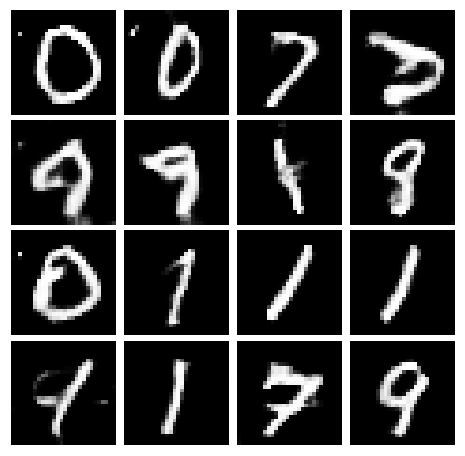 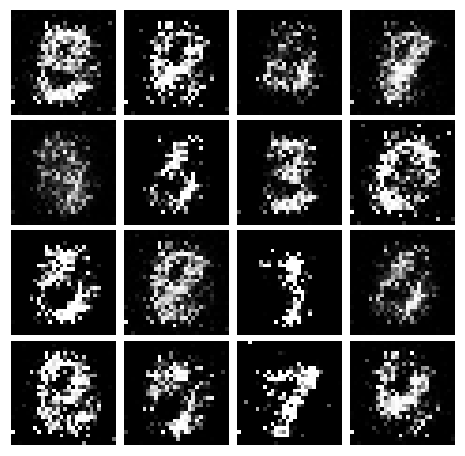 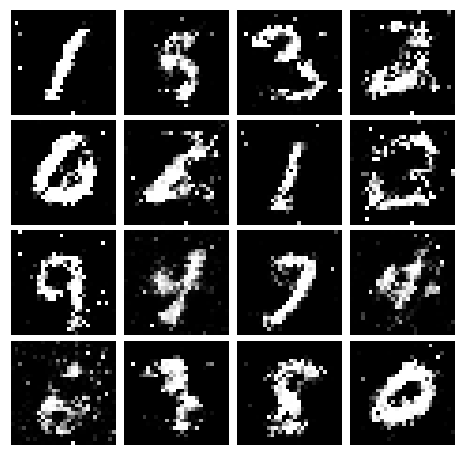 TensorFlow Tensor of generated images, with shape [batch_size, 784]. 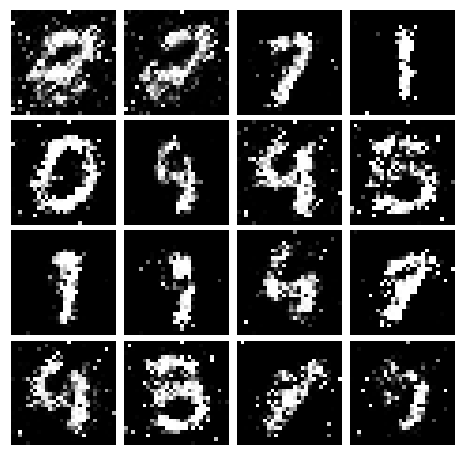 """Create solvers for GAN training. 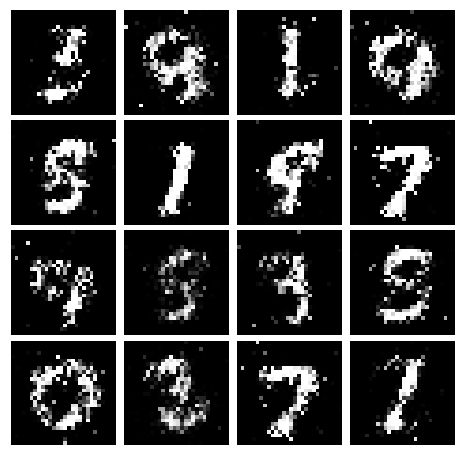 """Train a GAN for a certain number of epochs. 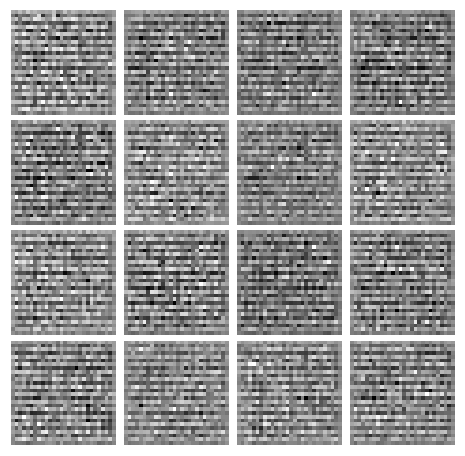 # print loss every so often. 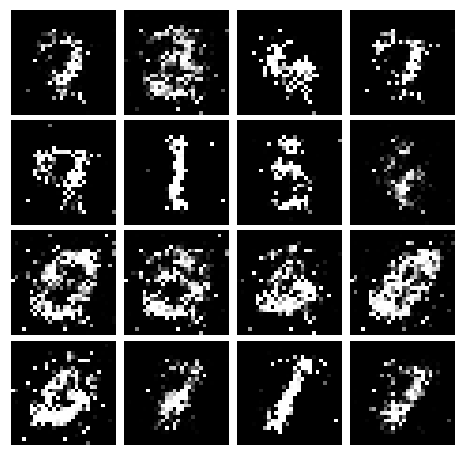 """Compute the Least Squares GAN loss. 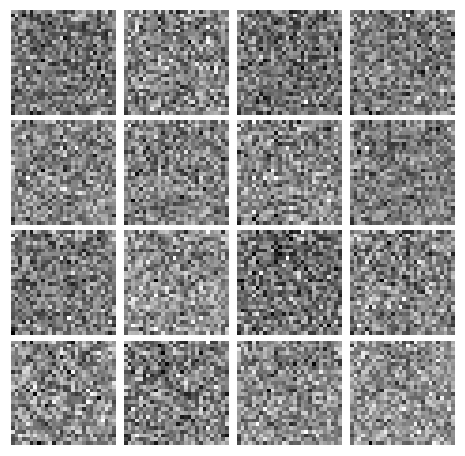 # Gradients of Gradients is kind of tricky!